University of Miami received a A.
U.S. News & World Report's ranking of 48 out of 201 of National Universities was a major contributor to this grade. Located in suburban Coral Gables rather than where parents fear—on South Beach—the University of Miami is a rising star among private universities, in large part due to the unflagging efforts of Donna Shalala. Chancellor of the University of Wisconsin before being Secretary of Health and Human Services in the Clinton Administration, Shalala is a diminutive powerhouse who means to improve each of the university's 11 divisions. While still competitive in Division I athletics, especially football, the Hurricanes have left behind some of the "gangsta bling" of the national championship teams a generation ago. Describe the type of student who should not attend University of Miami and explain why. Describe the type of student who should attend University of Miami. Why? What is a typical University of Miami student like? Describe the type of person that should attend University of Miami. What are the top 3 reasons someone should attend University of Miami? What was a typical University of Miami student like in high school? Describe the type of person that should attend University of Miami. Renowned programs in marine science and music are big draws; business is also strong. Top academic programs, a wide array of student activities, and a beautiful campus located in sunny South Florida. "The University of Miami's campaign to overcome its reputation as a "football school" is an unqualified success." UM's academics are on par with most upper-tier universities. A private research university with more than 15,000 students from around the world, the University of Miami is a vibrant and diverse academic community focused on teaching and learning, the discovery of new knowledge, and service to the South Florida region and beyond. Led by President Donna E. Shalala, the University is comprised of 12 schools and colleges serving undergraduate and graduate students in more than 180 majors and programs. In 2011, U.S.News & World Report ranked UM No. 38 in its "Best Colleges" listings, and it continued to be ranked as the top school in Florida; it also cited several of its programs in "America's Best Graduate Schools." In the past 10 years, UM has moved up 29 spots in the "Best Colleges" rankings. 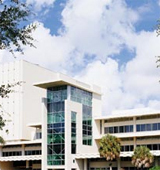 Established in 1925 during the region's famous real estate boom, UM is a major research university engaged in nearly $339 million in research and sponsored program expenditures a year. While the majority of this work is housed at the Miller School of Medicine, investigators conduct dozens of studies in other areas, including marine science, engineering, education, and psychology. What are the top 3 things that students do for fun at University of Miami? Campus housing is available for undergraduates. Housing deposit : $250.00. Housing deposit due : May 1. Housing deposit is not refunded if student does not enroll.. No cars. No pets. 69% of students graduated in the top tenth of their class. The average student pays $31,164 for tuition, fees, and other expenses, after grants and scholarships. Total stated tuition is $41,580, in-state and on-campus, before financial aid. Learn more about financial aid at http://www.miami.edu/index.php/office_of_financial_assistance/. Estimate the net price for you at http://public.cgcent.miami.edu/attendancecalculator/. 70% of students graduated on time. The typical (median) early career salary of University of Miami graduates is $45,700, according to Payscale. University of Miami participates in the NCAA Division I-A for college athletics. Want more info about University of Miami? Get free advice from education experts and Noodle community members. What are the job placement statistics from the the University of Miami? What are the most popular extracurricular activities at Miami? Student Government is by far the most spirited and exciting organization. I definitely recommend joining.